Nearly half of women across South Africa are subjected to violence by an intimate partner. This in turn negatively affects about one in four children. A child who is exposed to violence in the home also risks being abused and will, quite reasonably, fear for their own safety. The country’s government and civil society recently responded to the scourge of violence against women by hosting a summit to galvanise political support and develop solutions to end this sort of violence. Also recently, the #TotalShutDown movement embarked on protests across the country demanding an end to violence against women. This focus is a critical step towards addressing South Africa’s immense problem of gender based violence. But it’s important for campaigners to recognise that the problems of violence against women and violence against children are deeply intertwined. There’s an increasing global recognition that violence against women and children often occur together in homes, and are driven by the same factors. For instance, young boys who witness their mothers being abused in the home or who are abused themselves are more likely to harm women and children later in life. In South Africa, as in many other places, social and cultural norms promote a gendered hierarchy: men are in a superior position over women and children. These social norms provide considerable space for men’s violence towards women and children to be tolerated. They are manifested in expressions of masculinity, enforcement of gender norms and the way that children are disciplined. Evidence shows that men’s use of violence and controlling behaviour towards an intimate partner often extends to physically punishing their children as a means of discipline. Importantly, research is now revealing that women who experience violence at the hands of a partner are more likely to use physical punishment to discipline their children. This further drives the cycle of intergenerational violence. The impact of experiencing or witnessing violence as a child has wide-ranging and long lasting effects. When a child experiences violence at home, they learn to tolerate violence. They are also at an increased risk of suffering from poor mental health, engaging in drug and alcohol abuse and risky sexual behaviours, and contracting HIV. They are also more at risk of behavioural problems such as aggression, delinquency and poor social functioning. It’s also important to understand that children who have experienced violence are more likely to lack empathy towards others. That means they’re more likely to perpetrate violence. It is this aspect of exposure to violence that drives its intergenerational transmission. This has a direct impact on their relationships with intimate partners, as well as their ability to be emotionally responsive parents. Growing up in violent households affects a child’s sense of security, self worth and how they relate to other children. In qualitative research I conducted among violent men, they spoke about having previously witnessed violence against their mother by a father or stepfather. Many of the men described feeling scared for their own safety. They also felt powerless to protect their mother. It’s important for society to respond to both problems in a coordinated way to reduce their burden simultaneously. South Africa’s response to both violence against women and children has, until now, been happening in silos. It’s important that people start to join the dots. It makes sense to integrate approaches to both problems. The evidence showing what works on joint programmes to address violence against women and violence against children is only starting to emerge in low and middle-income settings. Successful programmes are targeting multiple stakeholders, challenging social norms about gender relations and the use of violence. At the same time, such programmes are also supporting greater communication and shared decision making among family members. South Africa has signed on to be a pathfinder country, as part of the United Nations’ Global Partnership to end violence against children. In line with this commitment, the government is developing a programme of action to end violence against women and children. 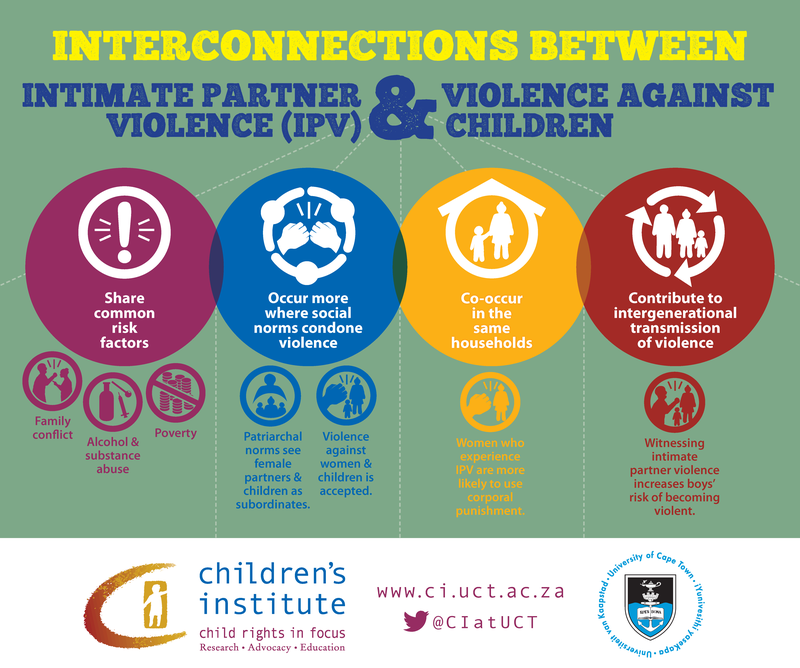 If children are to reach their full potential and the cycle of intergenerational violence is to be broken, South Africa must consider collaborative solutions. Any programme of action must be aimed at preventing violence before it happens and providing an effective response and support to those affected by violence. The author is a contributor to the South African Child Gauge 2018, which was released this week.